April | 2014 | Killed in a Smiling Accident. May contain sustained analogies involving otters. War Thunder has just received a major update, v1.39, bringing a bunch o’ new aircraft and assorted tweaks (full list in the change log). One of the more interesting changes is “User generated content support: maps, missions, camouflages and even custom aircraft”, supported by the War Thunder Content Development Kit (CDK). It’s very early days yet, but custom camouflage/skin support has been in place on the development server for a while so there are already a few options if you’re bored with your favourite aeroplane’s current paint job. 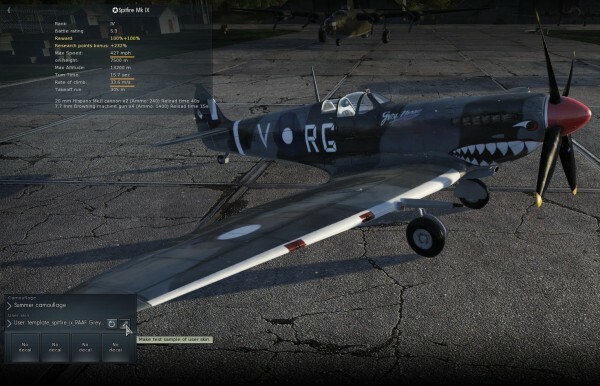 There are several places to get new skins; there’s a section on the official forums, and some dedicated sites like http://www.nexusmods.com/warthunder/ and http://wt-skins.com/ starting to pop up. The War Thunder subreddit also has a guide to skinning, plus filters to see user submissions. Custom skins are only displayed client-side on your own aircraft, other players don’t see them. This may be a little disappointing if you’ve put a lot of work into a design of your own and would like the world to appreciate it, but on a technical level you wouldn’t want megabytes of images being up/downloaded for every player in every match, and unregulated user generated content tends not to be a terribly good idea. I’m quite a fan of an Ork-inspired P-63, but a player striving for historical accuracy and immersion probably wouldn’t be so keen to see that in their game, and of course G*mes W*rkshop are notoriously litigious and may take a dim view. According to the FAQ particularly good user content could be incorporated officially in future updates, with authors receiving a share of the profits, a model that seems to work well for Sony and Valve amongst others. So if you’re handy with a graphics package and have a personal connection with a particular plane that you’d like to see replicated in the game, come from a country not currently represented by in-game paint schemes, or just fancy a nifty colour scheme, it’s well worth checking out this update. 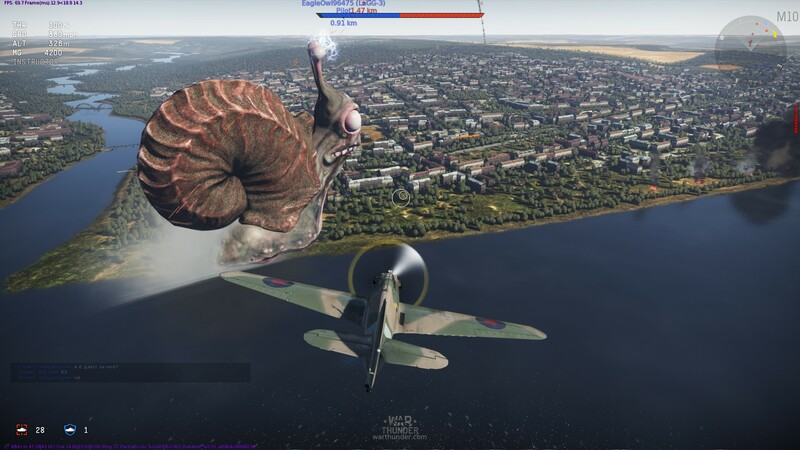 This entry was posted in games, war thunder, zoso on April 15, 2014 by Zoso. GTA V Not Released on PC! NotGames have just released NotGTAV, not an all-action hyper-realistic high-octane game set in Los Santos, but a rather fun little hand drawn Snake-type game set (partially) in Swindon. Inexplicably this seems to be the first game set in Swindon, according to my deep and extensive research (not finding a Wikipedia list titled “Computer games set in Swindon”); if NotGTAV does well I’m hoping we might see expansions set in Milton Keynes, Weston-super-Mare or Bognor Regis. OK, NotGTAV isn’t terribly deep, but as there’s still no sign of GTA V itself on PC it’s the closest thing you’ll get. Apart from GTA IV. Or III. Or the Saints Row series, or… quite a lot of other games, I suppose. Rather more importantly, though, it’s for an excellent cause, Peer Productions. If you feel that your sins are outweighing any Gaming Indulgences obtained via Humble Bundles, why not pop over and play with their slider (matron), even that raises a few laughs. This entry was posted in games, zoso on April 9, 2014 by Zoso. 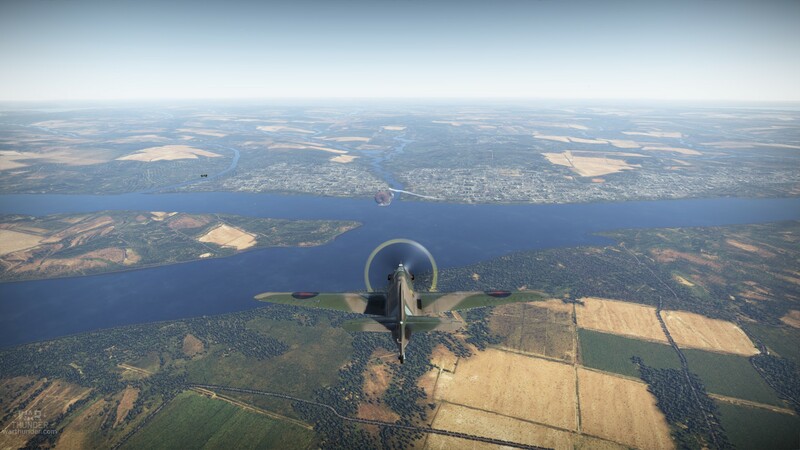 Testing has started on the next major update to War Thunder, so I wandered off to the development server to see what’s new. Hopping in to a trusty Hurricane, the mission briefing screen warned of a terrifying new Japanese secret weapon; what could it be? Giant snail at 11 o’clock! 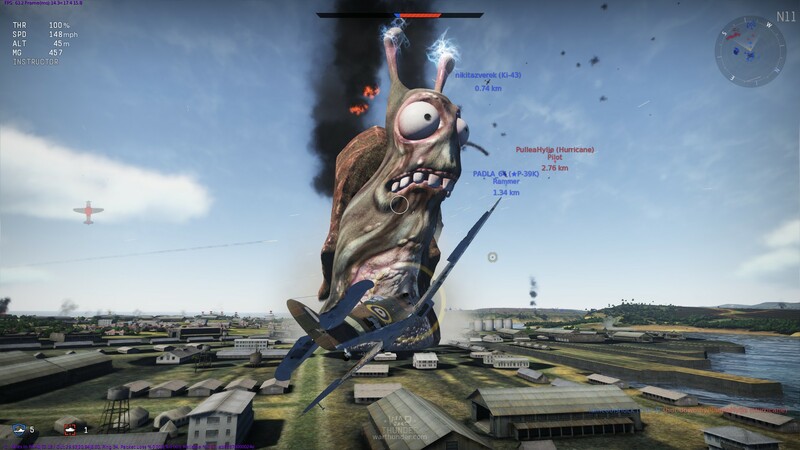 No sir, that’s not banter, it really is a giant snail. Yes, for one day only, War Thunder went a bit Kaiju, with one team trying to destroy Gaijilla and the other defending the giant snail-beast. Really rather fun! Could be an interesting asymmetric battle type in the proper game as well, though obviously you’d need to slightly tweak things to fit into a more realistic setting, perhaps having a formidable battleship like Tirpitz or Yamato as the main target. Or Mecha-Streisand. 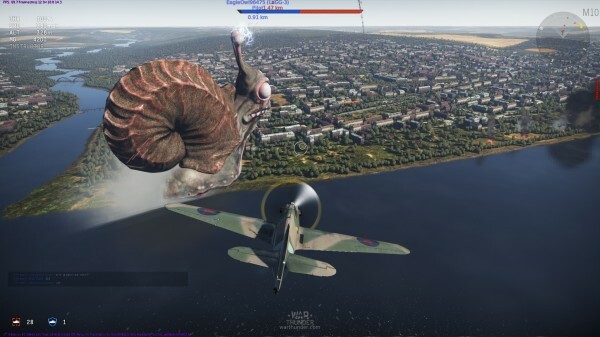 Hey, chief, I might be wrong, but I think we’re flying into a giant snail. 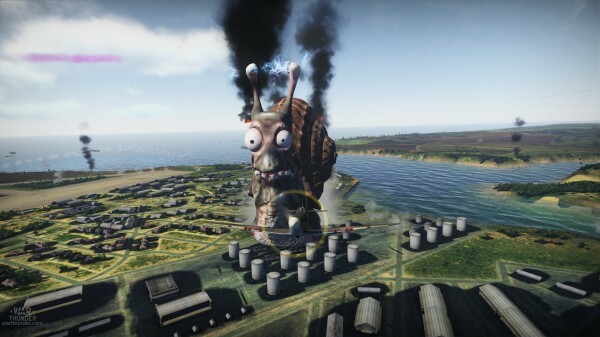 This makes me feel… scared of the giant snail. This entry was posted in war thunder, zoso on April 2, 2014 by Zoso. 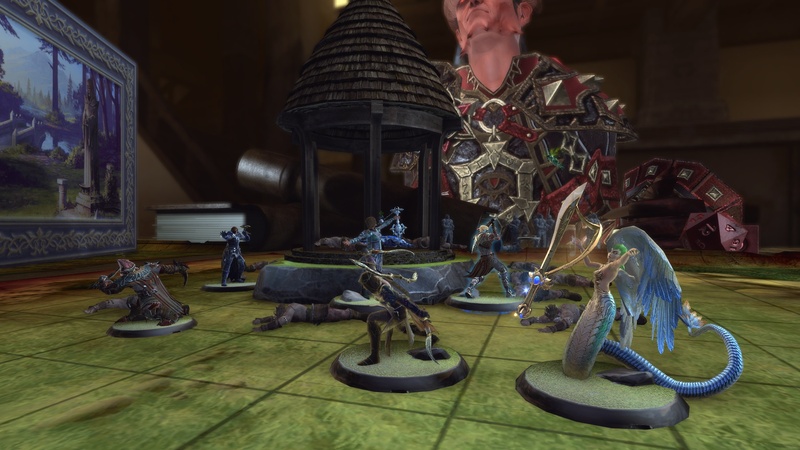 There is no escape from the realm of Dungeons and Dragons! 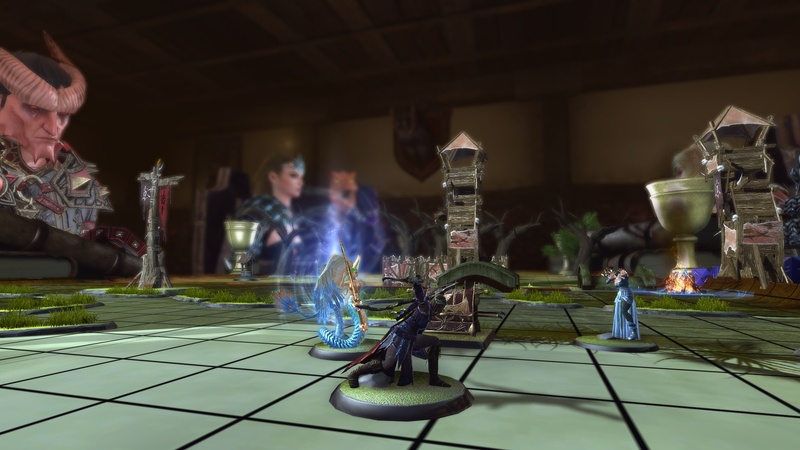 Cryptic are having a bit of early April fun in Neverwinter. The announcement of Dragons as a playable race was a fairly conventional jape, and news of a Gelatinous Cube mount seemed to be along similar lines, but no: it really exists as an in-game… thing. You can buy one from the store, and it’ll schlupp up your character and transport them around with an 80% speed boost while making strange glooping noises. Yes, it’s a pen and paper D&D adventure! The players all adopt their best Heroic Figurine Pose and glide around the map on fixed bases. A dungeon masterly wizard briefs you on your quest, investigating a dread dungeon or enchanted forest, and provides further narration and convincing NPC voices as you progress. With two basic adventures, each with several randomised encounter elements, there’s a lot to enjoy in the event, especially if you can run through it at a relaxed pace with a group of friends. Completing the event gives a chest of rewards with a chance for a couple of uncommon items, and the lustre wears off slightly when blitzing through at high speed with a PUG for the 19th time, but c’est la MMO-vie. 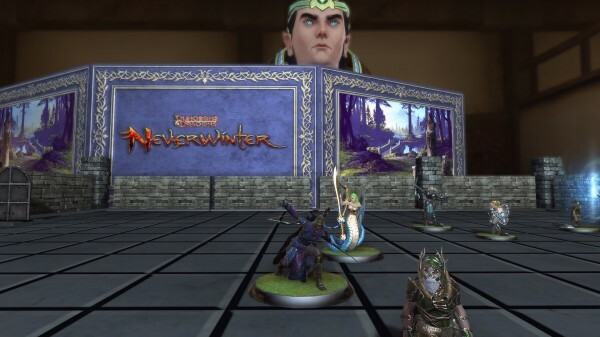 The event is running until Friday 4th April, so if you’re reading this before then and have a level 6 character in Neverwinter (or the spare hour or so it takes to run through the tutorial to get one) it’s well worth a look. 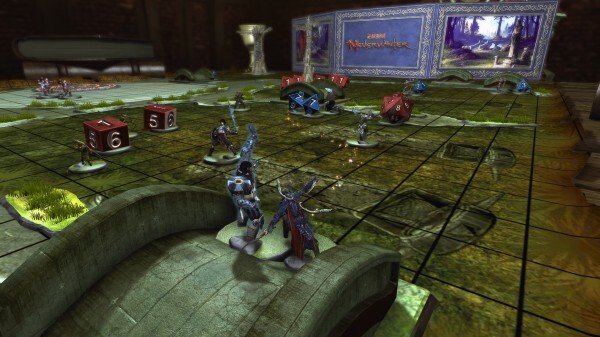 This entry was posted in neverwinter, zoso on April 2, 2014 by Zoso.